There is a creative wind blowing through this exciting South African city. 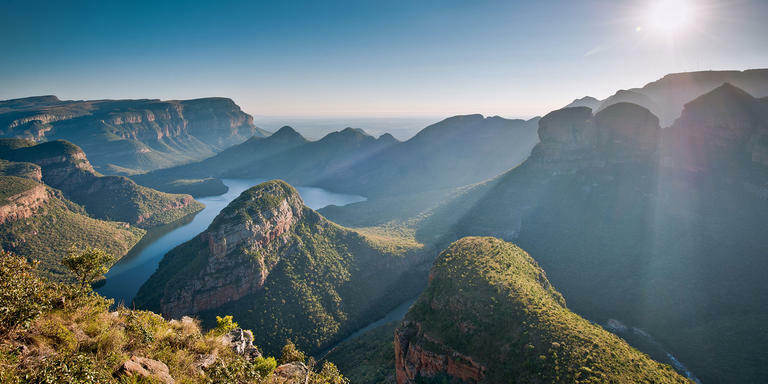 Head to this provincial capital and check out the African powerhouse for yourself. There are some unusual places in the city's industrial wastelands, innovative galleries which exhibit the talents of the young post-apartheid generation and an international fair – the First National Bank (FNB) JoburgArtFair – has become the benchmark for contemporary arts on the continent… After a night flight, you will find yourself in the bubbling cauldron of Johannesburg's artistic life. You will go on to discover up-and-coming neighbourhoods and trendy galleries in this megalopolis with its infectious energy. Make Main Street Life the base for your stay. This industrial building is home to artists and artisans, an independent cinema and also the 12 Decades Johannesburg Art Hotel. The hotel's rooms are individually designed, with a decor chronicling the last 12 decades of Johannesburg's history, and so fit in perfectly with your arty theme. When you drop off your cases, you get the impression of visiting an art gallery with all the photo frames, paintings and vintage and modern furniture. The streets around are teeming with trendy cafés. At Pata Pata bar, a Jamaican band provides the musical backdrop to your pre-dinner drink. Make sure you order a glass of Shiraz (the local Syrah) to accompany your biltong, a dried meat marinated in a mix of spices that the South Africans are mad for. Start your initiation into African art at the Wits Art Museum. Recently renovated, Johannesburg's African art museum is in Braamfontein, one of the city's most hip and trendy areas. Alongside art lovers and well-turned-out hipsters, you will be introduced to a new generation of painters, photographers, video artists and sculptors who portray the changing face of this cosmopolitan city. Every Saturday, a mixed ethnic crowd converges on the Neighbourgoods Market in Braamfontein. Clothing by young independent designers and food stalls of all kinds have sprung up on this former car park. Make sure you try the delicious chocolates at Honest's stand or the delicious tapenade at Christine's Olive before you head off to the Stevenson gallery, just a stone's throw away. This famous gallery focuses on contemporary South African art and it gives us a good insight into the local scene, showcasing up-and-coming artists and established international names. Look out for the works of one such artist, Dada Khanyisa, and her series of acerbic pictures depicting the daily life of Johannesburg's residents. Next day, you could spend the day in the cultural oasis of Maboneng. The area around Main Street, which used to be a no-go zone, has become an alternative area within a neighbourhood with great creative acclaim. For ten years now, young visionary entrepreneurs have been using culture to breathe new life into the area. First up is Arts on Main in the former industrial wastelands. From its metal balcony on the second floor, you can look out over the urban landscape. Explore the artists' workshops and containers converted into galleries. You will not be able to resist buying an original work of art or an arty limited-edition T-shirt. Head up to the bar snuggled away on the roof terrace where live bands play. This enterprising cultural hub is bursting with the best of Joburg's creative energy. Another vibrant district undergoing change, which cannot fail to charm, is Newtown. Make a detour to this neighbourhood with an industrial past, today at the heart of a burgeoning cultural scene. You can visit a contemporary exhibition at the Market Photo Workshop created by prominent photographer, David Goldblatt. Your tour of artistic Johannesburg nears its end at the Afronova gallery, set up by a French couple with a love of pan-African art. On your way back to the hotel, stop to admire the multi-coloured graffiti dotted along the way. What an amazing example of street art to round off your arty visit!